Holiday Arts and Crafts Fair this Sunday! The Pittsburgh Craft Collective is busy these days, putting on shows and great local events for the Pittsburgh area artisians and crafters. 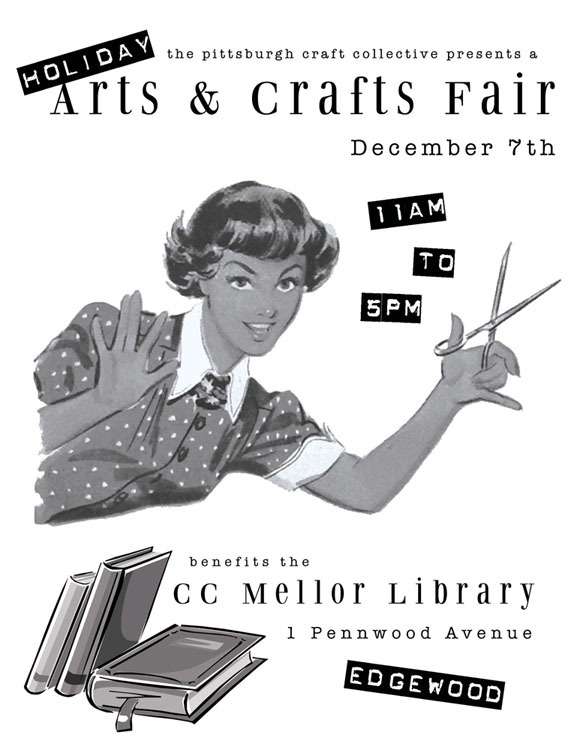 The Holiday Arts & Crafts Fair at the CC Mellor Library in Edgewood is just the latest offering. This holiday show is loaded with local talent. What does that mean? Crafters and artisians who live in your town and make all of their work by hand. Where: CC Mellor Library at 1 Penwood Place, in Edgewood, conveniently located just off the Parkway East and easily accessible from Shadyside, Squirrel Hill, Edgewood, Wilkinsburg, Forest Hills, and all points Pittsburgh! Click here to download the official flyer for the show. Buying local, and buying handmade for the holidays is a fantastic way to affect your world, at the community level. And, the event doubles as a fund-raiser to benefit the historic community library. Win-win for the civic minded and arts and crafts lovers alike! This entry was posted in Craft Shows, News & Events and tagged arts, cc mellor library, craft fairs, craft shows, crafts, edgewood, handmade, holiday arts & crafts fair, pittsburgh craft collective by strawberryluna. Bookmark the permalink. we’re going to miss our favorite screen-printing poster lady, though.